Power plant sites consists of numerous built up structures, each of which must be designed for positive margins of safety. Finite Element Analysis (FEA) is a common numerical method used for determining and improving the strength and dynamic performance of such structures. 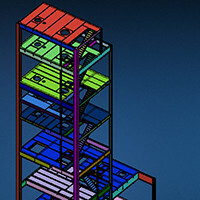 With an increasing need to find optimal power plant structural designs, the most efficient FEA workflows are critical. This case study discusses methods to expedite the FEA process, namely: rapid construction of Finite Element meshes from geometry and leveraging FEA technology to quickly connect hundreds of structural members. Most industrial structures consists of hundreds of structural members, many of which have the common trait of being thin-walled. This boiler structure, part of a large power plant, is an example that is characterized by thin-walled members. Finite Element Analysis (FEA) is a common method used for strength analysis, but the large size of this structure presents a number of challenges that can delay FEA. The first challenge involves constructing the finite element model, and traditionally requires hours of work. The second challenge is adjoining numerous structural members together, but the process should be both rapid and without error. The use of MSC Apex for mesh construction and the use of MSC Nastran for analysis is demonstrated.